Joining of companies provides unprecedented advantage for real estate professionals. We know what IDX and Agent Marketing can deliver, and that our combined products will become the core part of many agents’ marketing strategies. IDX, LLC, a leading provider of Software as a Service (SaaS) tools for real estate websites, today announced the acquisition of Agent Marketing, LLC, a fifteen-year marketing leader in the real estate industry, for $6 million. California-based Agent Marketing specializes in custom marketing solutions for real estate professionals. With a full-service print shop and web development resources in-house, Agent Marketing offers marketing tools for real estate agents and brokers worldwide. Adding Agent Marketing to the IDX suite of services creates a larger opportunity for current users on each platform to leverage their existing websites to drive more leads and transactions. As part of the acquisition, IDX, LLC added 17 full-time employees from Agent Marketing’s Aliso Viejo office; including Founder and CEO Greg Mazurek who will be joining IDX as the Divisions Operation Manager. This is IDX’s second acquisition since acquiring Agent Evolution in 2014, a leading WordPress platform for real estate agents and developers. IDX, LLC now employs 72 full-time employees. The combined company will allow IDX to offer its 80,000+ current users and 1000+ web development partners more strategic and innovative tools moving forward. Agent Marketing will continue to focus on their signature suite of real estate marketing tools, but will now have the expanded resources of IDX behind them to quickly scale their offerings even further. As early as Q1 2018, existing IDX customers will have the ability to seamlessly market their listings with new tools available through the Agent Marketing platform, with a push of a button. IDX is now a single source for any real estate agent or web developer that services real estate professionals. 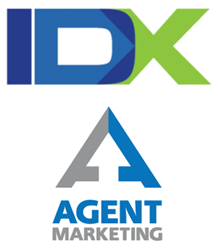 Agent Marketing will continue to operate under their own brand as a subsidiary of IDX, LLC. Based in Eugene, Ore., IDX, LLC is nationally known as a leading provider of real estate search applications. IDX, LLC actively manages more than $2 trillion worth of active listing data from more than 660 individual Multiple Listings Services (MLS). IDX, LLC provides integrated IDX software, customizable listing search utilities and lead management tools for real estate based websites. In addition to the primary web-based software, IDX also provides an integrated WordPress plugin for use in WordPress based blogs and websites (IMPress for IDX Broker), as well as HTML Mobile Optimized Pages for all mobile devices. The entire suite of real estate software available from IDX is easy to manage and maintain, helping real estate professionals display real estate data from their MLS regardless of their technical ability. For more information on all the services provided by IDX, LLC, please visit http://www.idxbroker.com. Agent Marketing is a nationally recognized technology and print services company, specializing in real estate marketing tools. Formally known as eProperty Sites, Agent Marketing offers a full array of online marketing tools for real estate professionals including single property websites, mobile marketing, virtual tours and personal websites. Agent Marketing also owns and operates a full-service in-house print shop dedicated to ensuring timely delivery of marketing collateral requested through the online platform. For more information on all the services provided, please visit http://www.AgentMarketing.com.